Photo courtesy of Yosemite Pines, California. Ok, so it's not really "camping". "Camping", at least for this writer, still means sleeping in a tent; which can be lots of fun for a family, but for most grown-ups, sleeping on the ground is only fun for about five minutes. And so begins a quest for gear: mats, inflatable air mattresses, and the list goes on. Which brings up another major drawback with camping: packing, loading, unloading, and setting-up tons of stuff. Not to mention buying that stuff in the first place, storing it somewhere over the winter, and finding (or not finding) it again next year. It's no surprise that some families jump into RV Camping, with conveniences such as beds and kitchen built in. Meanwhile, some campgrounds make getaways easy for their "campers" by providing cabins -- and other more novel forms of accommodation as well. Many campgrounds in North America offer cabins for rent. But why not try something a little different? In North America, a number of campgrounds now offer yurts that come complete with beds, kitchen gear, heaters, air conditioners, coffee pots, and maybe even a microwave. Historically, yurts are circular dwellings used since ancient times by nomadic peoples on the steppes of Central Asia. When Marco Polo visited Mongolia in the 14th century, he found nomads in yurts made of wood frames covered by animal skins, with dome-type roofs that opened at the top. A few decades ago, a number of companies rediscovered the yurt concept and designed attractive modern-day yurts. These distinctive round dwellings are cropping up at campgrounds now. 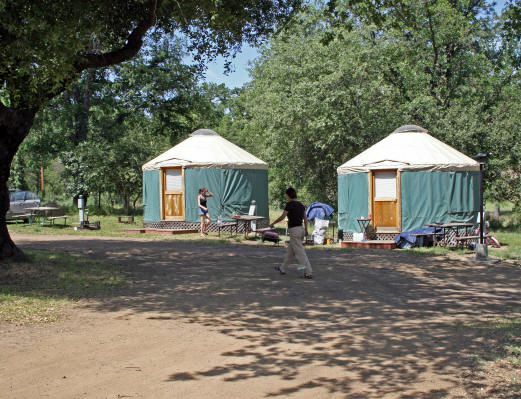 Yosemite Pines, for example, near Yosemite National Park in California, offers fully equipped yurts as well as cabins and camping sites. Beachwood Acres Camping Resort - next to 1400-acre Cowan State Park in Ohio -- has cabins, yurts, and cottages. Or how about a tipi? Try the RimRock Inn, in Oregon, which has fully outfitted tipis, with central firepit, futon mattresses, table and stools, lounge chairs, lantern, and even "decorative Indian-print pillows". Or a deluxe tent: at Eurocamp holiday parks in several countries in Europe, families can stay in "canvas accommodation": 3-bedroom tents, already set up when guests arrive and fitted out with a fridge, gas hob, and electric lights. Have a look at some of the amazing facilities at Eurocamp camping resorts: such as giant waterslides in a holiday park in France. Eurocamp holiday camps have restaurants, shopping, many forms of recreation, kids programs, even spas. There's no substitute for true camping: pitching a tent in a natural setting where you're fully surrounded by the Great Outdoors. But as a compromise that makes a family getaway so much easier, campgrounds are meeting a need by offering yurts, tipis, deluxe tents, etc. *Photos courtesy of Yosemite Pines RV Resort & Family Lodging and Merry Mac's Campground.